Star Trek: Asterisk "I, Mudd"
The Enterprise is hijacked and brought to a planet where their old friend, Harry Mudd, is in charge of a planet full of androids. It's not often when you see Bones turn around to investigate a guy who passed him in the hallway, but when he does, you can bet that guy is up to no good. Bones eyes Norman and comments on how there's something wrong with a man who doesn't talk about anything aside from the job at hand, never smiles and rarely goes into sickbay for a physical. Well, then Norman all but confirms there's something wrong when he goes down to engineering, knocks everyone out and sets Enterprise on a course toward Mudd Planet. While they're on their way, Norman stands still on the bridge and never budges. When they arrive, he wakes back up and reveals himself to be an android. Which doesn't seem to be much of a problem since when they beam down to the planet, the entire population is made up of androids except for a familiar face: one Harry Mudd. When last we saw him, he was pimping out his women to lonely space miners. Well, now he's been marooned on this planet where he is he only human. He's bored and needs human interaction since all the androids want to do is study him and learn about humans. So Norman took it upon himself to bring him more humans! Hooray! And then Mudd shows them an android that he had made specifically for him. It's designed to look exactly like his homely shrew of a wife. When you turn her on, she nags and nags and nags and you can tell her simply to shut up and she will. It's really too bad that Mudd isn't set up with the same feature. The androids explain that they were made from a species that lived in the Andromeda galaxy. The species has long since been destroyed, but the androids survived. They can last for 500,000 years, after all. It doesn't take long before Kirk knows his true purpose to bring all of the Enterprise crew down for the androids to study and to take the ship to get away from this awful planet. All of the crew has beamed down and been replaced by androids. Mudd is all packed and ready to go... and then Norman says he can't go. Well, there's the twist. The androids are programmed to serve. They are going to go to Earth, serve the humans until they're dependent and then take over the world. So what do you do in case of rogue AI? Know your logical paradoxes. This is where the lols begin. In an attempt to take out all the androids, the crew start acting completely silly and illogical. They dance around to no music, they contradict themselves, throw fake explosives like baseballs, pretend to die and then get up, etc. In the end, they get Norman by Kirk saying that everything Mudd says is a lie and Mudd saying "I am lying." Norman blows up and, since he's pretty much the control hub for the entire population, they are saved! 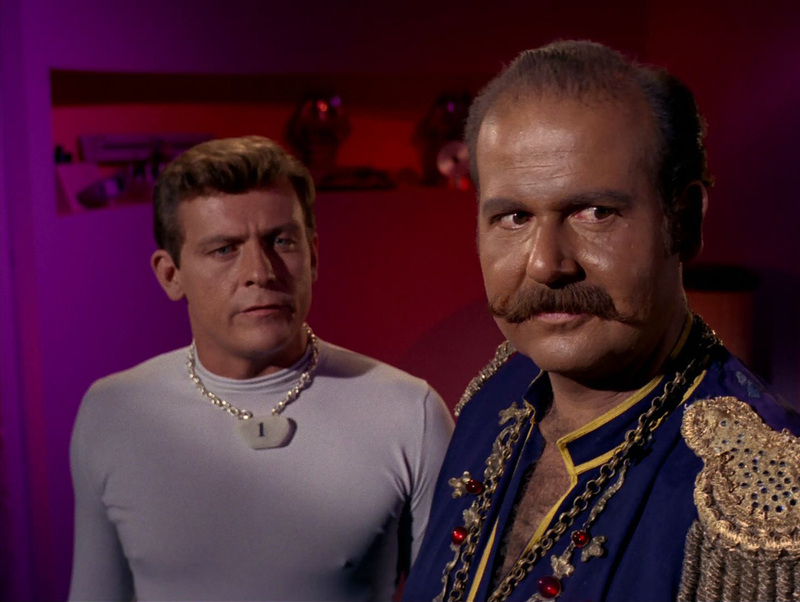 In the end, Kirk decides to leave Mudd on the planet with all the working androids as punishment. Mudd is cool with this 'cause, Hey! Free sexbots! But then Kirk reveals that he's made 500 copies of Mudd's wife-droid. And this model isn't able to be turned off. They will be nagging Mudd for eternity. This episode is simple and hilarious. 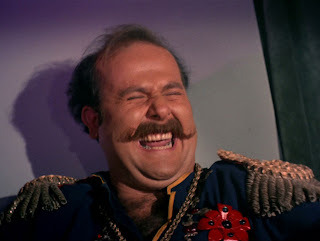 Mudd is a classic comedy villain - the kind you love to see have bad things happen to him. If you wanted to find a deeper meaning in the episode, I suppose it could be a warning about not becoming dependent on technology, but why would you want to do that? This episode is all about the lols.